The Platform for Agricultural Risk Management (PARM) in collaboration with its partners raised the need to foster the exchange of knowledge and bring together the experiences available on Agricultural Risk Management (ARM) in developing countries with the objective to build and develop a more structured collection of good practices and lessons learned on ARM as guidance for policy makers and rural development practitioners to strategically implement and mainstream ARM. 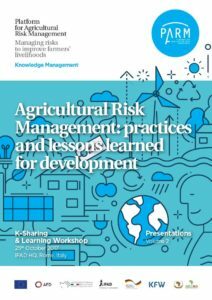 For this purpose, the Platform organized an International Workshop on practices and lessons learned for development in Agricultural Risk Management on 25 October 2017, at IFAD headquarters in Rome, Italy. Building on selected case studies and lessons learned on ARM-related practices, technologies or institutional arrangements, the workshops aimed at facilitating knowledge-sharing and learning to draft guidelines on how to build on existing ARM experience, how to measure their adoption and impact, and how to better design “ARM-proofed” projects. For this purpose, the workshop brought together over 70 participants from policy makers, rural development practitioners (development and knowledge partners), farmers organizations and private sector to share strengths and weaknesses of their ARM experiences. Although a full impact assessment of different ARM initiatives is beyond the scope of this workshop, examples of detailed assessment were conveyed. Facilitate knowledge sharing, peer-to-peer, south-south cooperation and partnership-building on ARM among practitioners. In preparation of the workshop, a Call for Proposal has been shared among key stakeholders at global, regional and local level with the objectives to identify good practices and lessons on ARM. The proposals have been evaluated by a Technical Committee and 28 selected initiatives were featured into the input document that served as background material for the workshop. In addition, the selected initiatives participated and contribute to the working groups and were showcased during the workshop. The sessions was in the form of interactive panels and world cafés. The aim was to facilitate the learning process through the exchange between practitioners of different ARM initiatives, and the feedback received from technical experts. The outcomes of the discussions will then result in the development of the final publication on ARM tools and lessons learned . The final publication will be peer-reviewed by the Technical Committee and is planned to be published by end of June 2018. Provide guidelines for better design and assessment of agricultural risk management practices.